ASLLI-161 | Size: 50 ml / 1.69 fl.oz. Offer an instant lift and rejuvenation. The cream is ideal for those who want a daily age-defying and renewal regimen, a wrinkle-free skin. After 10 days, the skin microrelief is redefined. 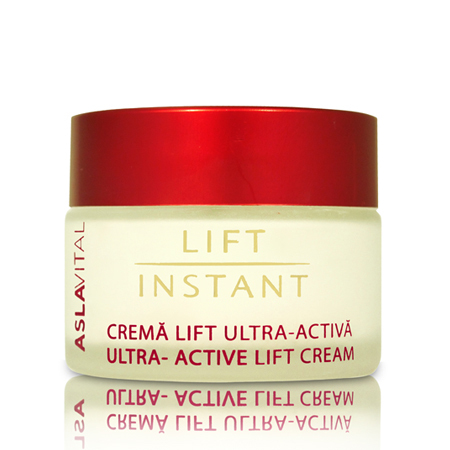 An ultra-lift moisturizer and nourisher that restores youthfulness to your skin. Infuses skin with moisture, nourishes, soothes and protects. Boosts cell’s renewal process, corrects skin’s deficiencies. Tightens and firms, while revealing a rejuvenated and renewed appeareance. VITAMIN A - It accelerates cell renewal, stimulates collagen production, helps reducing wrinkles and fine lines. BOSWELLIA SERRATA - Has a strong anti-inflammatory effect. INGREDIENTS: AQUA, GLYCERYL STEARATE, CAPRYLIC/CAPRIC TRIGLYCERIDE, PROPYLENE GLYCOL, ETHOXYDIGLYCOL, GLYCERIN, FERULIC ACID, PEG-40 HYDROGENATED CASTOR OIL, ORYZA SATIVA BRAN OIL, METHYLSILANOL MANNURONATE, CETEARYL ALCOHOL, CETEARETH-22, GLYCINE SOJA OIL, SQUALANE, ALCOHOL, ACMELLA OLERACEA EXTRACT, BUTYROSPERMUM PARKII BUTTER, DIPALMITOYL HYDROXYPROLINE, DIMETHICONE, DIPROPYLENE GLYCOL, BOSWELLIA SERRATA RESIN EXTRACT, TOCOPHERYL ACETATE, SODIUM POLYACRYLATE, HYDROGENATED POLYDECENE, TRIDECETH-6, RETINYL PALMITATE, HELIANTHUS ANNNUUS (SUNFLOWER) SEED OIL,ETHYLHEXYLGLYCERIN, MAGNESIUM ALUMINUM SILICATE, TETRASODIUM EDTA, SODIUM HYDROXIDE, PARFUM, BHA, BHT, SORBIC ACID. the product is very well .I used this for 3 years my face look firm and elastic.good product. Not feel so lift ...rnBut penetrate the skin, dullness is taken of the skin. rnSo nice product!